I have blogged about the beauty of Sangklaburi before – sharing photos of the mountains and the rivers close to Thailand’s border with Myanmar. I had the chance to visit that area again last week as I took our new CVT volunteer, Lindsey Monroe, up to the village where she will be working. 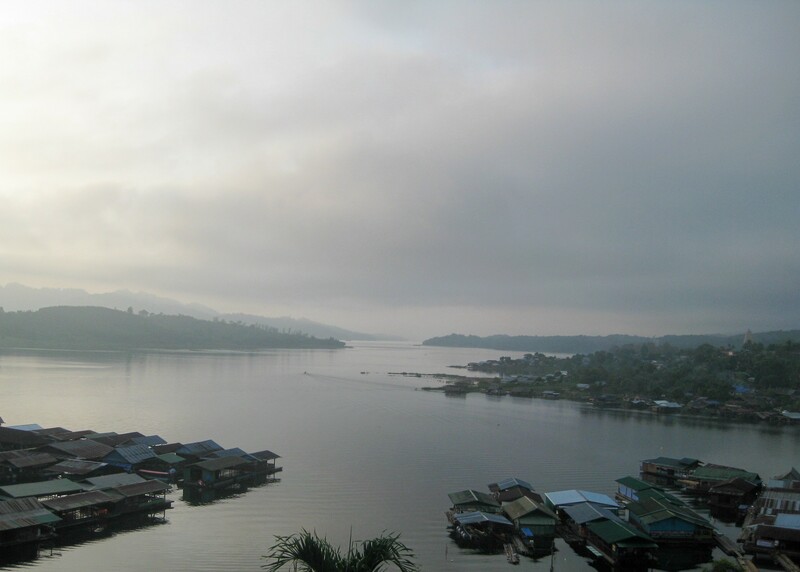 Sangklaburi is still beautiful, as this photo – taken in the light of dawn – will attest. The morning mist hovers over the water and hides the mountains from view. Still, it is a place that draws many visitors, especially after the rains have stopped and the air turns crisp and cool. The first breath of coolness came through as we visited, lifting the dampness and making each day comfortable to be outside. Many people visit this area in the Cool Season, traveling though the mountains to this border area in order to visit Three Pagodas Pass, the beautiful Mon Temple, or to see the longest wooden bridge in the world. 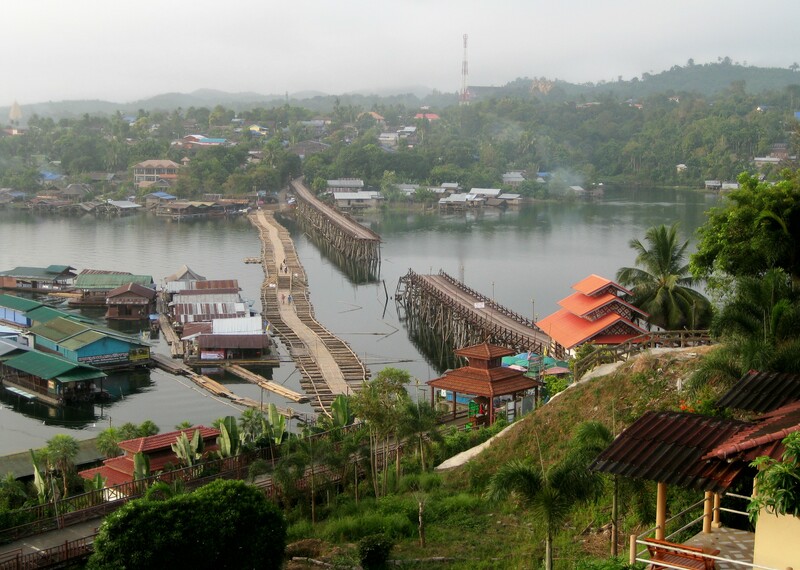 Unfortunately, the longest wooden bridge in the world is no long something that visitors can walk across. As you can see in this photo, the center section has been destroyed. As the story goes, some enterprising loggers had taken several loads of uncut teak logs and dumped them in the river to float them downstream to the mill. A violent storm came through with heavy rains. The resulting flood of water pushed the logs into the bridge broadside and the sheer weight of the logs, driven by the storm waters, caused the center section of the bridge to collapse. 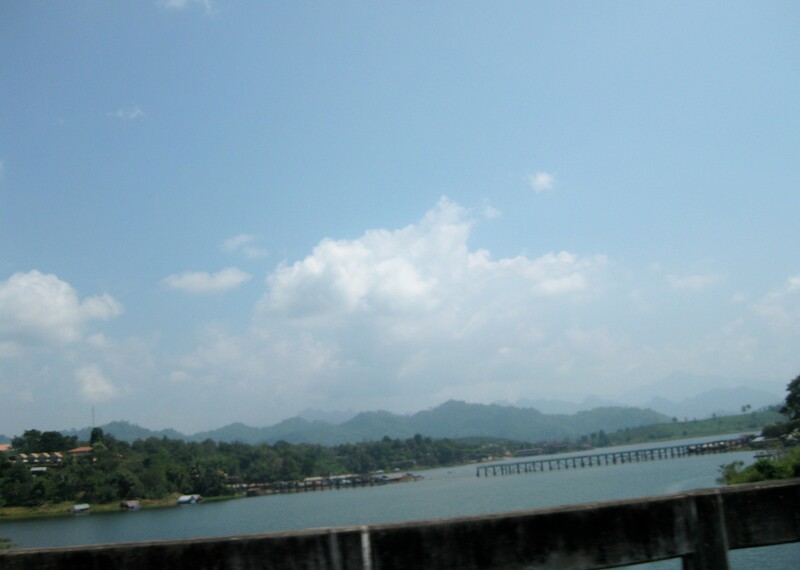 As you can see, a temporary pontoon bridge, made of bamboo, has been built to handle necessary traffic across the water until the main bridge can be repaired. Many of the families living in houseboats on the river also had their homes destroyed or damaged in the same storm and subsequent flood. They are all working to rebuild their lives. Please pray for them as these families of fishermen are not wealthy, but often struggling to survive. This disaster has just added to their already weighty burden. It does not help that one of their tourist attractions has been taken out of commission. The money from tourism helps to sustain the economy in this area. This entry was posted in Uncategorized and tagged architecture, challenge, climate, daily life, expectations, people, special places, volunteers. Bookmark the permalink. Wretched poverty and its sufferings! May miracles come from this sad situation and beauty be restored, plus.